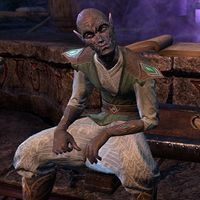 Gavros is a Dunmer alchemist hired by the Rethan brothers to research a Daedric formula for turning skin into ebony within the Vassir-Didanat Mine. He managed to translate, but discovered the ebony it produced was false, and the formula itself was originally provided by Clavicus Vile. He soon devised a way to turn the formula into an airborne concoction, but it soon proved to difficult to contain and engulfed the entire mine in a poisonous purple mist. He is found in the Daedric ruins of the mine, dying from the illness created from the formula. "You... I don't recognize you. You've made a terrible mistake in coming here. Do you feel it yet? The cold rush through your veins―the stiffness in your joints? Only a matter of time, now. Only a matter of time." Master Rethan brought me on to study a Daedric text―a formula for turning living flesh into a substance akin to ebony. Not a perfect match, but close enough." And you lost control of it? "Something like that. But what does it matter? I'll be frozen solid soon. Black as midnight. A commodity―nothing more. Ironic. You mean to rob me, I suppose. The scroll's just there. Have a care with it. Wealth always comes at a price." Is there no cure for this affliction? "None. Well, none that I've discovered anyway. I speak modestly when I say that if there was a cure, I would have found it already." "I guess I could squander my remaining hours searching for a remedy. But I'm an alchemist. A daedrologist. We don't trouble ourselves with things like "hope." I leave that nonsense to priests, and children, and the mentally ill."
How did you contract the illness? "Why do you even care? Fine. I altered the formula, turning the liquid decoction into a vapor. It proved to be very effective. Unfortunately it was nearly impossible to contain. Hence... this." Why would you agree to this? "What? Afflicting all these miners? Oh, spare me your crude moral outrage. They were wastrels. Laborers that were too ignorant or too lazy to find work anywhere else. This is as meaningful a contribution as they were likely to make." "None. I'd invite you to kill me, but given that I'll be dead soon anyway, it's hardly worth the effort." If you speak to him after taking the Mysterious Formula, he will say "Now, all that's left to do is wait..."
He is the author of False Ebony, The Source of the Formula, and Test Results. This page was last modified on 17 March 2018, at 20:31.